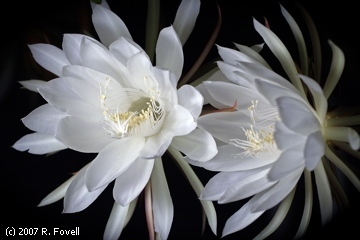 Three of the cereus' buds flowered last night; here are some pictures. I am occasionally asked by people to make enlargements and reproductions of the pictures from my main cereus site for them. Personally, I'm not set up to handle these requests. As a trial, I have created a website where reprints and enlargements can be ordered, called cereus.exposuremanager.com. The site is subdivided into three galleries, based on the resolution of the camera used to make the shots. 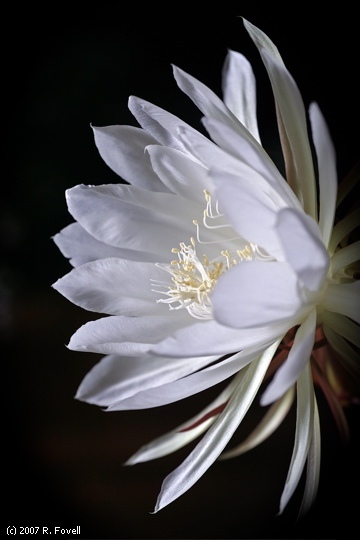 Many of my personal favorite pictures, those shown on the main cereus site, are 2 megapixel photographs. Those won't likely enlarge well beyond 8x10, so I strongly discourage you from doing that. Unfortunately, I see no way of preventing people from ordering massive enlargements of those pictures. A reminder: Please feel free to leave comments on any post on this site, but if you do so anonymously, I won't be able to respond to you. What beautiful pictures you've taken! I can only imagine the actual flower!! It must be breath-taking!! I have a cereus(flat-leaf) that I was given as a gift. Can you tell me how to propagate it? How to care for it well so it will flower? I'd appreciate any help you can offer!!! THANKS!! I have had a Night-Blooming Cereus for around 20 years. It did not bloom at my prior office for at least the first 10 years. I didn't find out what it really is until two years ago. After almost 5 years at my current office, in a South-facing, tall store-front window, it started blooming with a vengeance. That year, someone came in breathlessly off the street saying he had sold them until about 15 years earlier in Chicago, but hadn't seen one since. I'm in Madison, Wisconsin, so the plant stays indoors. I have branches supported from the ceiling with string to help prevent it from dominating too much space. The branches reach probably 4-5 ft in each direction from the pot. It bloomed 40 or more times each of the past two years beginning as early as May. It currently has 10 blooms forming. They tend to take 10 days or so to mature and open. One of the 10 will open in a few days, the others should open in a little over a week. I'll be experimenting for the first time with a time-lapse web-cam this year. In past years, I've come in at night and crawl around on the floor to get pictures. 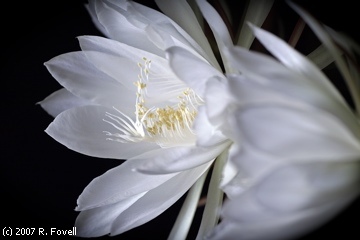 Very much enjoy your site and the quality of your cereus and non-cereus photos. I have one ready to bloom, tonight!!!! Thanks for the photographs, they gave us some clue as to when to lose sleep. This will be a first for this neglected cacti. I've had her for 24 years, with no bloomage, and this past month I have missed 2 flowers, so I am setting my alarm for this one. I'll attempt to take some very amateur digital pics, with some kind of professional-looking background....Wish me luck!